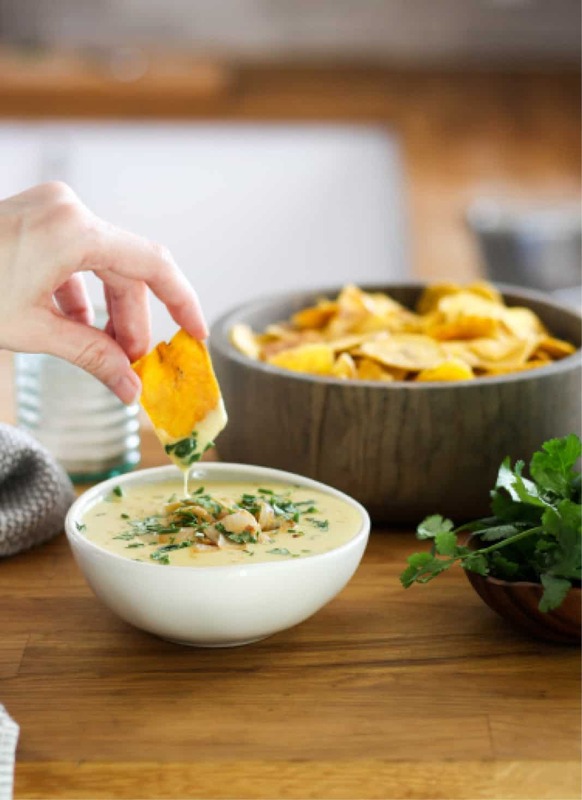 This Dairy Free Cheese Dip is the perfect party food whether you’re following Whole 30, AIP, or Paleo. 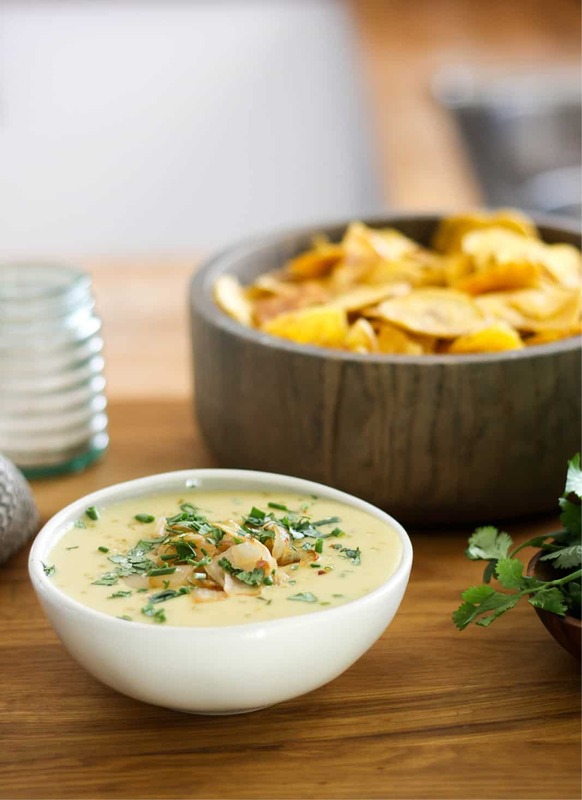 Personally, I love topping this Cheese Dip with sautéed onions, cilantro, chives, and bacon, and using tostones (I explain how to make plantain tostones in this recipe!) to dip. I’d love to try it with spinach and artichokes for another flavor profile, or drizzled on chicken, rice, and broccoli. This recipe is cheesy in flavor, creamy in texture, and thick and drippy – so keep reading for the recipe! Confession: I get jealous when I see a family on TV eating Kraft mac and cheese/nachos/tacos for dinner. Those meals just seems so easy, inexpensive, and satisfying. Now let me preface this by saying there is nothing wrong with a family who chooses to eat any of these meals. However, my family personally doesn’t do well eating gluten, corn, or dairy, so unfortunately these foods are out for us. I wanted to create a go to recipe that can be used to satisfy my mac and cheese/nachos/taco cravings, while catering to my family’s personal dietary choices. 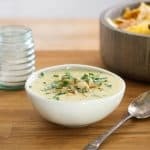 I sought out to create this cheese dip to be used as a component in a plethora of other recipes that are to follow: AIP Bacon Cheeseburger Nachos, AIP mac and cheese, AIP loaded tater tots, etc. What I didn’t realize is how much I’d love it all on it’s own (with chips, of course). After tinkering around with the recipe for a few weeks, I finally perfected it. This Cheese Dip reheats well, stays thick and creamy, and is nearly impossible to mess up. 1. 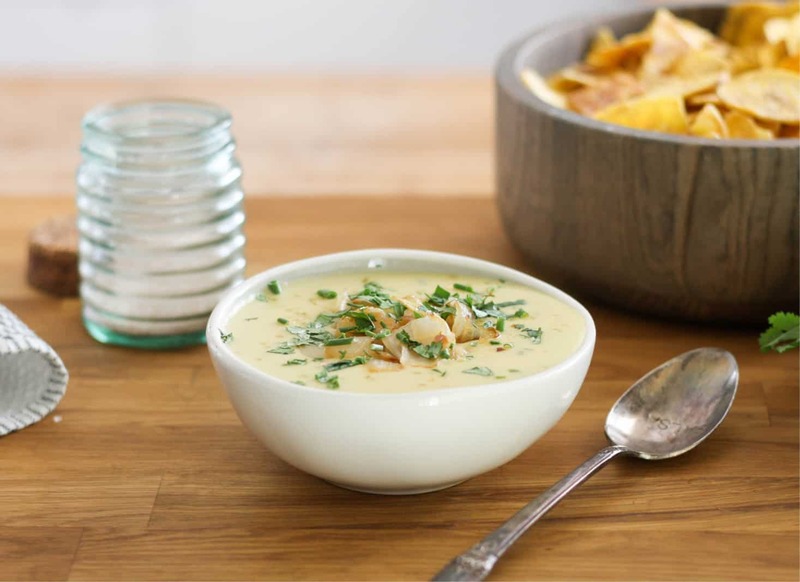 Topped with caramelized onions, cilantro, and bacon with your favorite chips to dip. 2. Drizzled on shredded chicken, steamed broccoli, and white rice. 3. Loaded with spinach and artichokes with Jackson’s Honest corn chips on the side. 4. Melted on top of plantain chips or tostones along with bacon, hamburger, onions, avocado, and no’mato sauc… see these Bacon Cheeseburger Nachos. 5. As a dressing on top of your favorite salad. I’d love to hear what you pair with this Cheese Dip! If you try the recipe, let me know in the comments what you enjoyed it with! Using a high powered blender, blend cauliflower rice, coconut milk, nutritional yeast, apple cider vinegar, bacon grease, sea salt, garlic and onion powder. Be sure all the cauliflower is well blended. Depending on the brand of coconut milk used, this mixture may not end up smooth. Don’t worry if this happens, as the coconut will melt over the stovetop and become smooth. Transfer mixture into a pan and heat over medium heat until the mixture is completely smooth. If it isn’t becoming smooth, it’s likely that your cauliflower isn’t blended completely. If this happens, transfer back to the blender and blend until smooth. In a bowl, whisk together tapioca starch and water. Pour slowly into warm mix. Whisk until the dip becomes very thick and starts to stick together. Pour into a serving bowl and add sautéed onions, chives, cilantro, as desired. 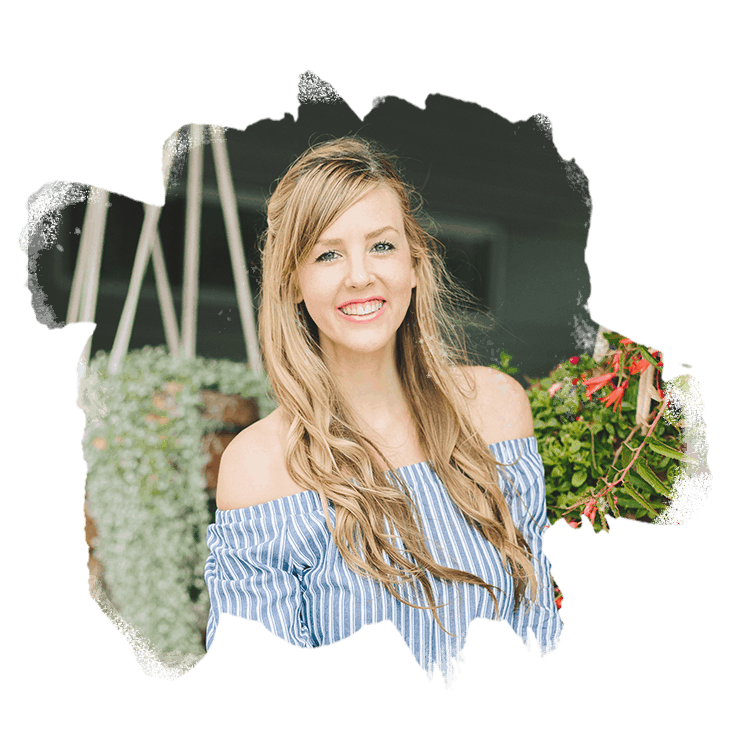 Serve alongside plantain chips or sweet potato chips for AIP or Paleo, and tostones for Whole 30, or use it to top my Bacon Cheeseburger Nachos. Click here to Pin in this recipe!